It’s the 21st anniversary of Worms, and Team17 is celebrating it by launching the best version of the game yet! 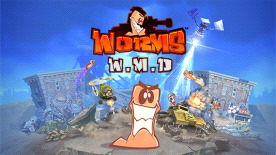 Worms W.M.D has a new look and new features, delivered by an engine that creates the best Worms gameplay experience ever. Be sneaky and hide out in buildings, use mounted guns, and get around in a range of different vehicles. Take the fight online and compete in multiplayer matches, all with the essential feel of the classic Worms experience. Keep your eyes out for more exciting W.M.D content to be announced! Classic Gameplay, Back by Popular Demand: We hear you! Worms W.M.D sees the reintroduction of the much loved ‘classic’ Ninja Rope, and we’ve recreated some of the key physics and gameplay that made the previous games so popular! Online Multiplayer and Great Single Player: Create havoc online in ranked or friendly multiplayer modes, with room for up to 6 players and 8 worms each on a map! There’s also plenty for the solo player to do - Worms W.M.D comes locked and loaded with a huge arsenal of Training Missions, Campaign Missions, and Challenges.